It's an interesting phenomenon...teams coming together...getting traction...thinking bigger than they did previously. I'm part of a team of human resources executives that are jelling right now. We've worked together for the last couple of years, although we're separated by more than five states. Sometimes distance without a commitment to new forms of communication make it difficult to stay connected in today's world. But we're jelling now...and it's good. We didn't start out this way. We've been adding members to our team as new organizations are acquired and become part of the larger enterprise. Team dynamics are funny sometimes. Every one's intentions have been positive, but there is no substitute for time, building trust, and shifting the focus from transactional to strategic thinking. You can't rush progress...but you sure can nurture it along. There was a time when we all took assignments as part of our evolving group. We each felt the obligatory guilty tug to take a piece of the whole and do our fair share. Or at least it seemed that way to me. We don't take assignments anymore. Our focus has shifted, and so has our commitment to each other. Now we take the lead on projects and come back to the team with ideas, recommendations and controversial solutions. We have healthy conflict now, and still like each other afterwards. In fact, we now acknowledge that our meetings are good. When was the last time you left a meeting and said it was good? The team is producing high quality work now, and we have so much more we know we can accomplish. It's an exciting time; and, even after long meetings you can feel the difference in the room. I hope you can help create that same culture where you work. For me, it's a whole new reason to think it bigger...and make a difference. 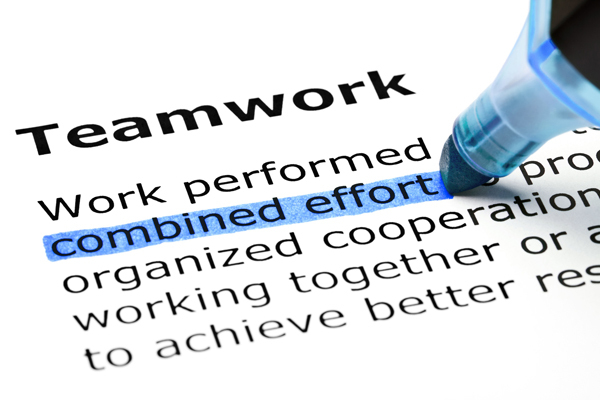 Team is a loosely used term in the corporate environment. The so called "Marketing Team" maybe just a few people collected to perform. It takes time to convert "groups" into "Teams"